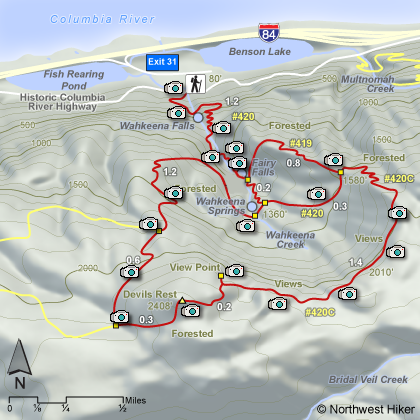 Moderate climb to base of falls then a steep climb to an overlook of the Columbia River Gorge. The trail continues up a steep grade past Fairy Falls. There are a couple of junctions in the trail which offers the hiker a choice of ways to reach the Devil's Rest turnoff. The easiest route to 667C stay on Trail #420 until you reach Trail #420C to Devil's Rest. The trail climbs steeply up	7 switchbacks then levels off for most of the remaining distance to the View Point. It is a steep climb in a wooded area to reach the summit of Devil's Rest. There are no views at the summit. But as you hike along the rim of this circ, you will get increasingly better views of the gorge and the mountains to the north. The best views come just before you get to the summit of Devils Rest, by leavning the trail for just a short walk to the cliff edge. On a clear day you can see Mt. Adams and the tip top of Mt. Rainier, as well as spectacular views of the gorge. As you proceed to the top of Devils Rest you will be in dense forest. After reaching the summit, which is just a few feet off the main trail, you can return to the trail and make a loop hike as indicated on the map. This ads variety and adventure. The photo below was taken from the cliff view area and is looking northeast toward Mt. Adams. From I-84 take Exit #31/Multnomah Falls. Park in the parking lot and walk under the footbridge to Multnomah Falls Lodge. 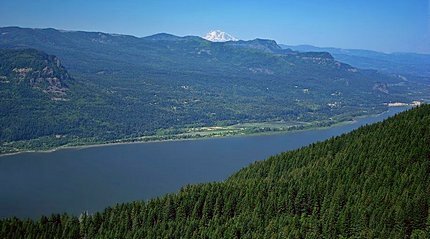 Alternatively, take I-84 east to Exit #28/Bridal Veil and drive east on the Historic Columbia River Highway to the Wahkeena Falls parking area. Coming from the east on I-84, take exit 35 (Ainsworth Park) and drive about 5 miles west on the Historic Highway (pass Multnomah Falls) to reach the Wahkeena Falls parking area and trailhead.